TECA's respected Quality First™ training programs are developed by the industry, for the industry, setting minimum standards for the residential and light commercial heating, ventilating and cooling trade in British Columbia. Our courses provide contractors the information they need to install equipment that operates safely and comfortably at rated efficiencies. Quality First™ numbers for Forced Air, Hydronic Systems Design and Ventilation are required by regulatory authorities in an increasing number of municipalities throughout the province. TECA courses are offered in spring and fall in the Lower Mainland, Okanagan, and on Vancouver Island, and may be held in varying locations based on demand. Seats are sold on a first-come, first-served basis. TECA training courses require a minimum number of participants. If course minimums are not met by the registration deadline advertised, TECA reserves the right to cancel the session. Registrants will be notified of the next available session in their area. TECA members enjoy discounts on training! All employees of TECA member companies (see Current Member Listing) receive the member price listed for courses, as well as for manuals and software. Course registrants can opt to join TECA on the registration form to qualify for the discount. The demand for our Quality First™ courses is growing and TECA instructors put their years' of industry knowledge and expertise to a good use. To register, choose from the following list of courses, then view the upcoming courses schedule. PLEASE NOTE THAT OUR QUALITY FIRST FORCED AIR COURSE IS CURRENTLY BEING UPDATED SO THAT IT IS COMPLIANT WITH CSA-F280-12. WE HOPE TO HAVE THIS READY FOR DELIVERY ASAP. WE WILL SEND AN ANNOUNCEMENT TO OUR MEMBERSHIP WHEN TRAINING IS AVAILABLE. TECA's Quality First™ Forced Air Guidelines course includes room-by-room heat loss & heat gain for systems with A/C coils and heat pumps; equipment selection to heat loss requirements for furnaces, A/C coils, and heat pumps; and duct sizing & layout to selected equipment capacity for standard and low pressure systems. Successful participants of the 24-hour course receive a registered number on a certificate and wallet card. Development of the new heat gain/heat pump material was funded in part by the BC Ministry of Energy, Mines & Petroleum Resources under the Energy Efficient Buildings program. The development of minimum standards for the correct sizing, design and installation of high efficiency equipment and systems is the basic building block to the achievement of the government's target reductions in energy consumption. Manuals include technical information and documents necessary to meet requirements of municipal inspection authorities. TECA's Quality First™ Forced Air Guidelines databases are made available to inspection authorities on request for purposes of confirming successful completion and issued number. Registered Forced Air Guidelines numbers must be renewed every two years. Course fees include 22 hours of instruction, the 2-hour exam, and the Quality First™ Forced Air Guidelines Manual (provided at the start of class). Software is not included. In some locations for intensive sessions, lunch may be provided. Course fees will be adjusted accordingly. NOTE: Section 9.36 Energy Efficiency: This section has been signed into law for all permits pulled after December 19th, 2014. No Longer will it be legal to run heating ducts up exterior walls. 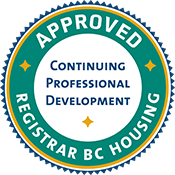 The BC Housing, Licensing and Consumer Services recognizes and approves TECA's Quality First Forced Air Guidelines course for Professional Development Points. To date, TECA has offered this course 259 times and 1,784 industry professionals completed it. COMING SOON, SCHEDULED DELIVERY DATE APRIL 2019. TECA's Quality First™ Heat Loss / Heat Gain course includes instruction of the CSA F280-12 calculation methods, as well as a copy of the TECA-developed Heat Loss / Heat Gain software and instructions for use. The course is intended to help participants perform accurate and code-compliant heat loss and heat gain calculations. The BC Building Code calls for CSA F280-12 for calculation of heat loss and heat gain, for Part 9 buildings. The training manual elaborates on the CSA F280-12 calculation methods. Additionally, the manual highlights the TECA Heat Loss / Heat Gain software and provides instruction for application. To date, TECA has offered this course 4 times and 11 industry professionals completed it. PLEASE NOTE THAT CURRENT VENTILATION CERTIFICATION IS A PREREQUSITE TO THIS COURSE. Each HRV checklist will require a valid HRV course stamp from an approved industry course provider such as TECA. The BC Housing, Licensing and Consumer Services recognizes and approves TECA's Quality First Heat Recovery Ventilator Design & Installation course for Professional Development Points. To date, TECA has offered this course 12 times and 93 industry professionals completed it. To date, TECA has offered this course 122 times and 2,101 industry professionals completed it. To date, TECA has offered this course 36 times and 302 industry professionals completed it. TECA's Quality First™ Ventilation Guidelines course covers the latest (December 2018) requirements of BC Building Code Section 9.32 Mechanical Ventilation. It also provides the prerequisite information required for TECA's HRV course (soon to be released). Successful participants of the one-day course receive a certificate, wallet card and numbered stamp for use on TECA's Mechanical Ventilation Checklists. Manuals include technical information and documents necessary to meet requirements of Municipal Inspection Authorities. TECA's Quality First™ Ventilation Guidelines databases are made available to inspection authorities on request for purposes of confirming successful completion and issued number. Certified Ventilation Guidelines numbers must be renewed at BC Building Code change, approximately every 5 years. NOTE: Course fees include 6 hours of instruction, the 2-hour exam, and the Quality First™ Ventilation Guidelines Manual, provided at the start of class. Software is not included. The BC Housing, Licensing and Consumer Services recognizes and approves TECA's Quality First Ventilation Guidelines course for Professional Development Points. To date, TECA has offered this course 277 times and 2,881 industry professionals completed it.